Precision: SLIM PRO's patented technology gives this 1.9mm tip the most accurate and precise writing and drawing experience. Sensitivity Adjustable Tip: sensibility adjustable tip minimizes offset and latency. Turn the tip with its specially designed mini tool for easy stroke-size adjustments. Apps Compatibility: SLIM PRO is compatible with a wide range of devices, OS platforms and apps. 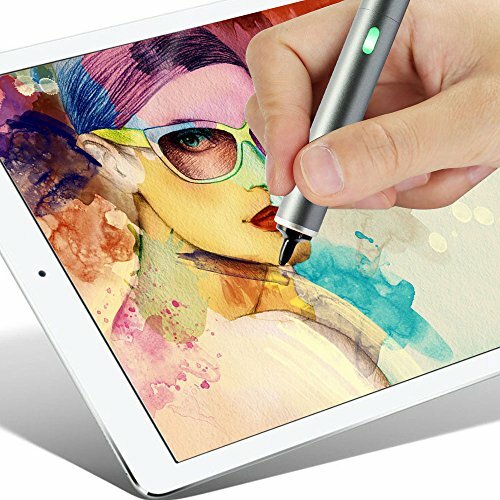 It works with most apps for note-taking, sketching, drawing etc. and other apps that support stylus input. Please make sure your device is not in charging mode and it's recommanded not to use screen protector on only ipad Pro 12.9" , other models are fine to use screen protector,please make sure the screen protector is less than 0.30mm . Please always de-activate first the original brand's stylus at " setting " or at any of the app you want to use , so your device can accept other brand's stylus pen . please adjust stylus tip,the longer tip you set the stronger signal you get . Vise Versa . Contact us if you need further support. ADJUSTABLE TIP FOR SENSIBILITY：Made of durable POM material, the1.9mm fine point precision tip is built with a sensibility adjustment function which offers the most perfect and accurate writing and sketching experience with your electronic devices. COMPATIBLE WITH：iPad 1 2 3 4, iPad Mini 1 2 3 4, iPad Air 1 2, iPad Pro 9.7/12.9 (if with screen protector max 0.3mm thickness), iPhone 5/5S/5C, iPhone 6/6S Plus, iPhone 7/7 Plus, iPhone X/8/8 Plus ,Samsung smartphones & tablets, Asus/Dell/Surface notebooks and more. EASY TO USE：No software or pairing needed, simply switch on power button to use. Then twist the tip to adjust the desired signal strength - weak for lighter strokes and strong for heavier strokes. USB CHARGER AND RECHARGEABLE BATTERY INCLUDED：The USB charger, and 2 rechargeable batteries keep your stylus ON always . * When USB charger is in charging mode , indicator light is red , and LED light turns blue when battery is fully charged . UP TO 5-7 HOURS OF CONTINUOUS USE：Powered by rechargeable battery, up to 7 hours of use with AAAA Alkaline battery or up to 5 hours with Ni-MH AAAA 300mah battery (included). Great for long commutes, travelling and day to day use. Manufacturer: Koopin Ind. Co., Ltd. Publisher: Koopin Ind. Co., Ltd. Studio: Koopin Ind. Co., Ltd. If you have any questions about this product by letech+, contact us by completing and submitting the form below. If you are looking for a specif part number, please include it with your message.